It’s funny how these things come together sometimes. No matter how hard you try to remember everything, or how much research you do, you’re bound to completely forget a few places. And sometimes, the biggest, most unlikely-to-ever-be-forgotten stores are the ones most easily overlooked. Such was the case with PACE Membership Warehouse. At least I wasn’t the only one. None of the 700+ folks on our Facebook page had mentioned it thus far, either. So last night, while glancing at my WordPress dashboard, I noticed something new in the search engine terms module. Typically, the phrases I’ll see are things like “laurel movie theater”, “irish pub laurel maryland”, and “laurel mall closing”. These are terms that someone has entered into a search engine (Google, etc. ), which subsequently led them to this blog. As you can tell, they were pretty adamant that it wasn’t Shoppers Food Warehouse. It took a moment to register what this place could possibly be, but then it hit me. PACE. 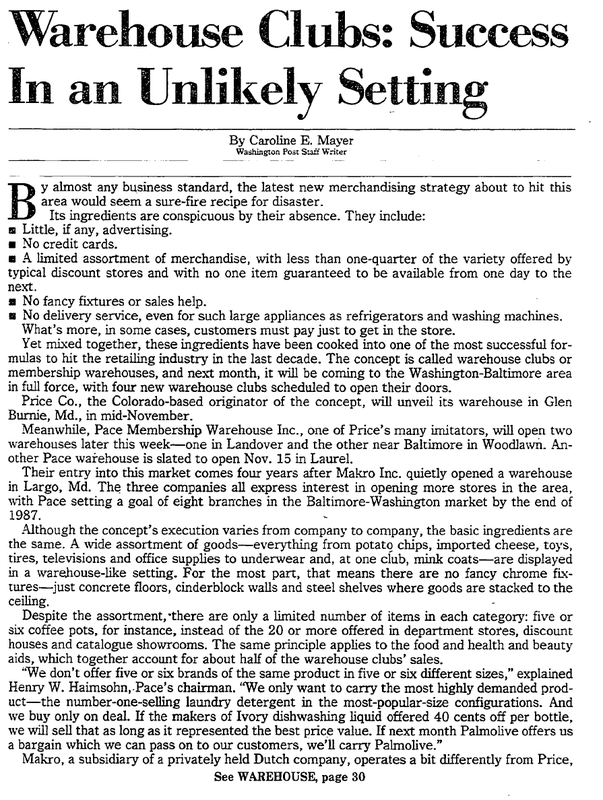 It had to be PACE Membership Warehouse, the innovative wholesale giant that opened in Laurel in 1985. 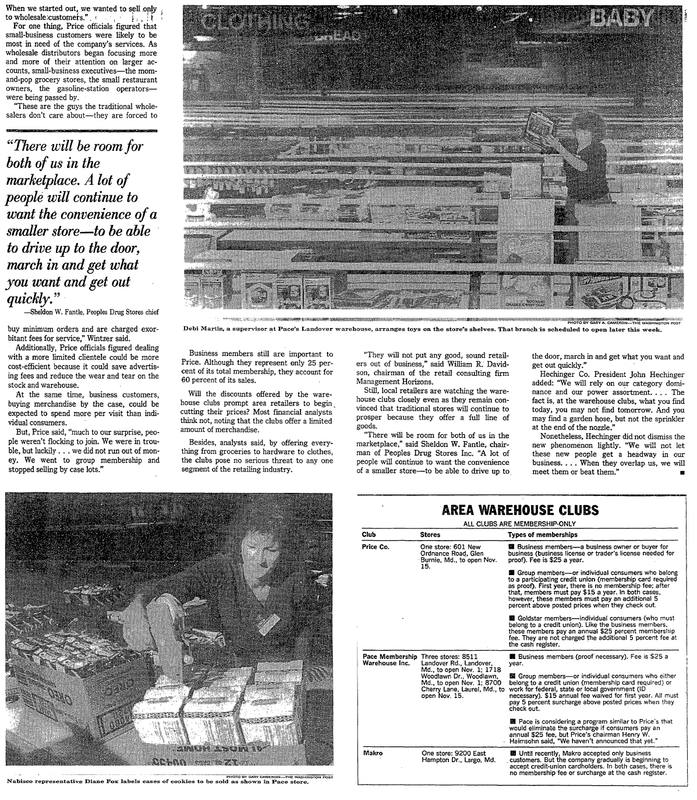 At the time, it was a whole new concept: a massive, spartan warehouse filled with bulk buys for membership-based customers. According to reports, there were only 8 other companies like it in the entire country, and none in the Baltimore-Washington region. 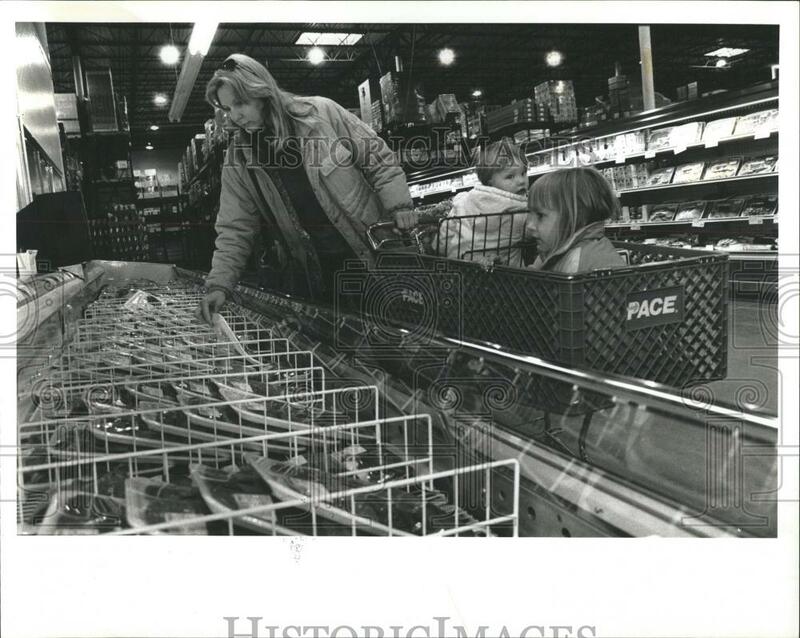 According to Wikipedia, PACE was founded in 1983, and was part of the Kmart Corporation. 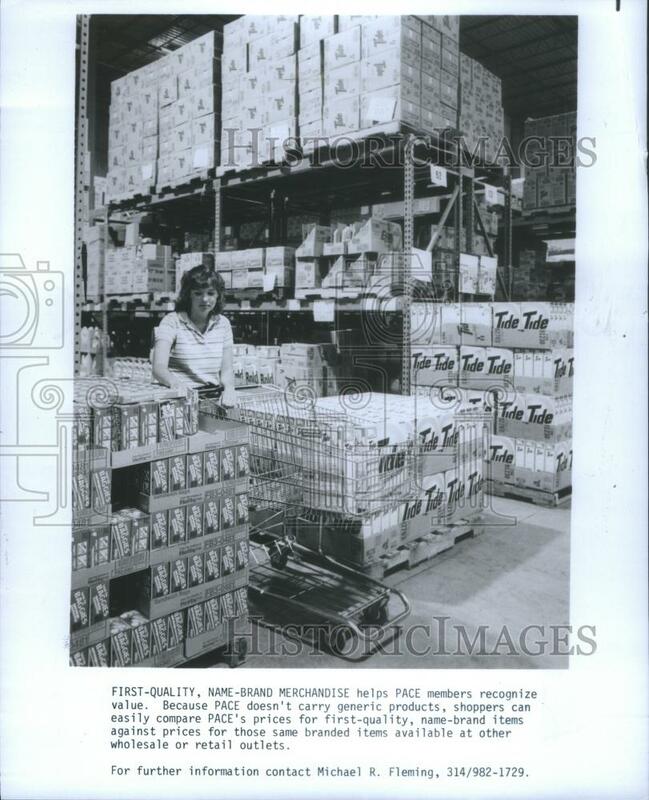 Not coincidentally, two other warehouse clubs also began operations in 1983: Costco and Sam’s Club. Right behind them, in 1984, came BJ’s Wholesale Club (which was started by another familiar Laurel retailer, by the way—Zayre.) 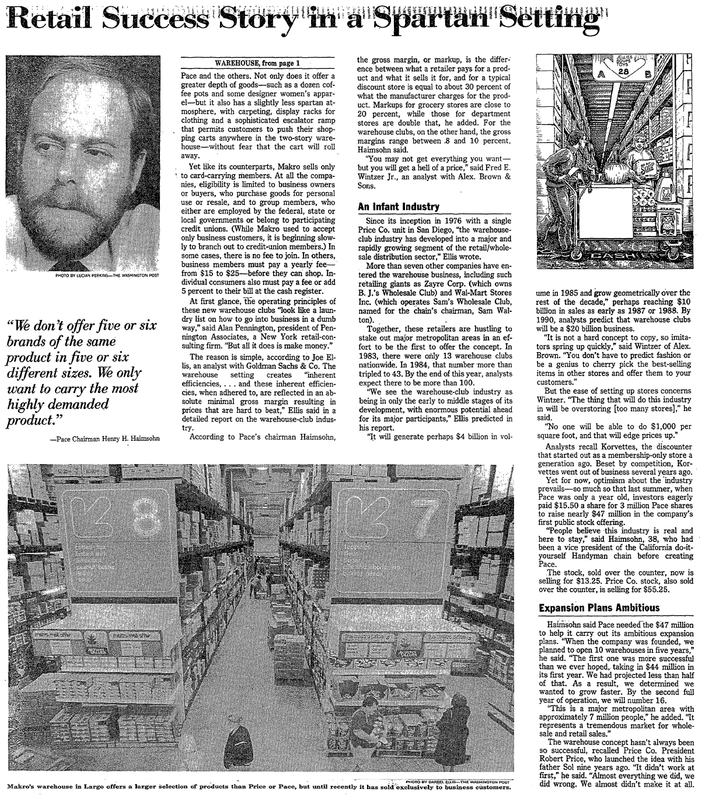 All of these followed Price Club—recognized as the very first warehouse club—in 1976. 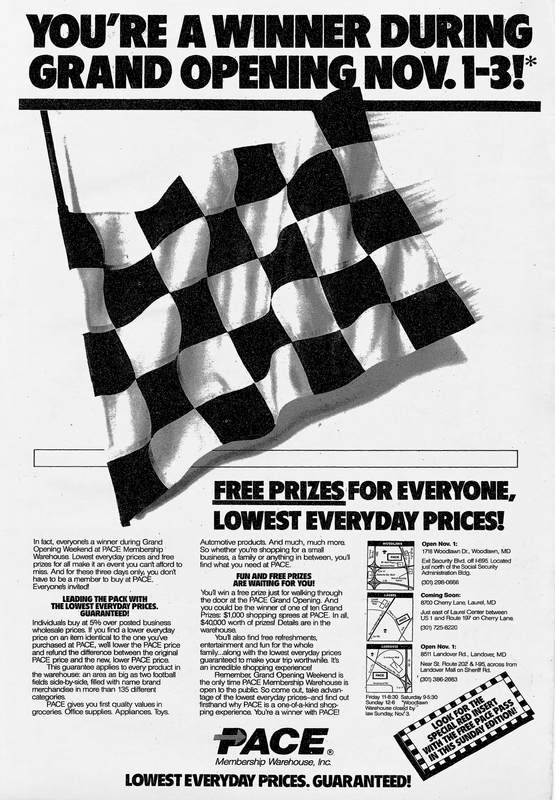 By the early 1990s, the competition was pulling away, however; and PACE, unfortunately, just wasn’t able to keep pace. In 1993, Walmart acquired it from Kmart and converted many (but not all) locations into Sam’s Clubs. After posting just the logo alone on Lost Laurel’s Facebook page, dozens of people began to reply—including many who worked at PACE. Surprisingly, they apparently hadn’t thought about it in years, either. Below are a number of press photos from 1986 and 1992, respectfully, which are being sold by the Historic Images photo archive on eBay. And following those are a couple of particularly interesting articles (as well as display ads) from local papers leading up to the opening of the Laurel store. With today’s prevalence of big box stores and its effects on small town commerce, these articles are somewhat prophetic. It’s also ironic that PACE itself would be absorbed by Walmart, with whom so many countless small businesses simply haven’t been able to compete. 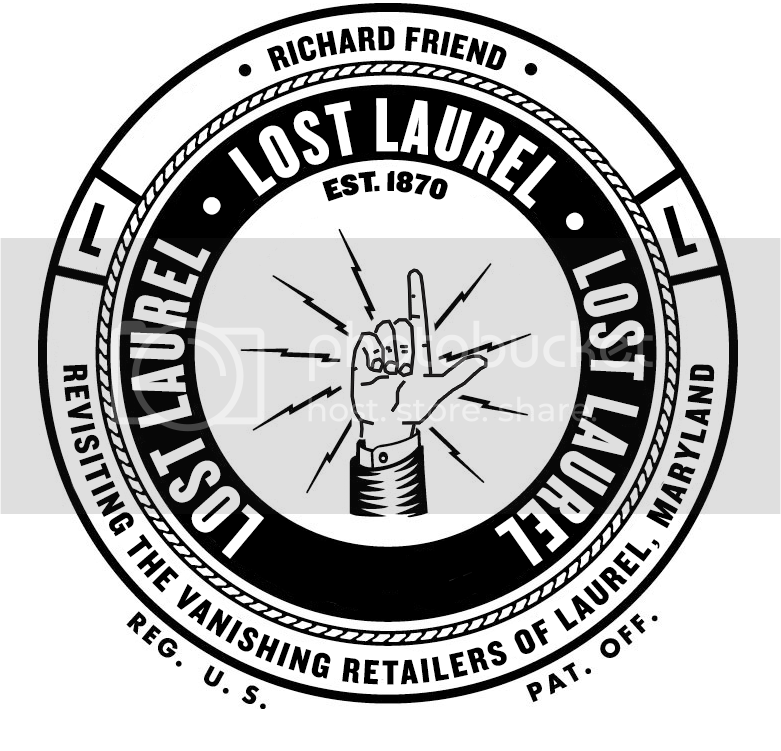 I’m still hoping to track down some photos of the actual Laurel store; but in the meantime, hopefully whoever was searching for PACE returns to see what what their initial search prompted… and what we’ve uncovered so far. Funny how things work. My kids dug out an old 3-hole punch from the back of a desk drawer and left it sitting on my desk. I realized it had the Pace Membership Warehouse logo on it and decided to see if there was still any information on the place. Look what I find. 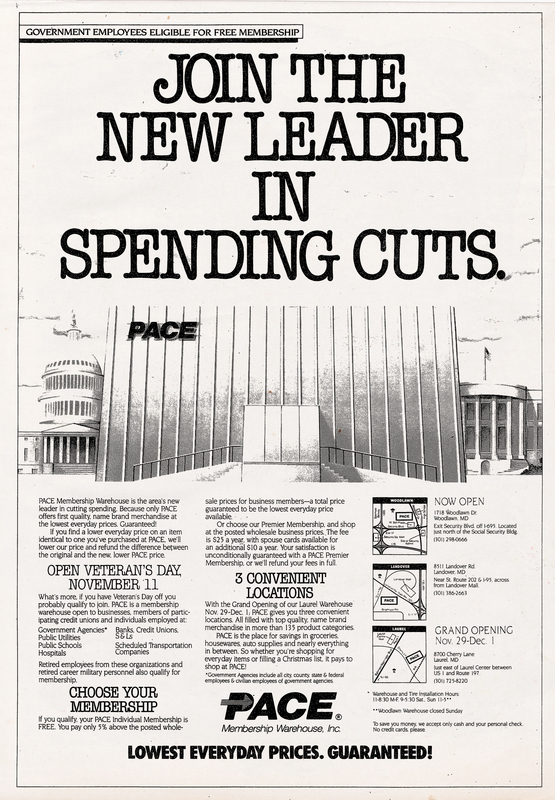 Pace was actually started in late 1982 early 1983 in Denver. Their first warehouse, lovingly referred to as ’01’ once they started expanding, was just off of I-25 and Peoria in Aurora, CO. I worked there for 3 1/2 years, starting my first summer out of high school. I started off on “the front lines” as a “caller”. The “front lines” were the cash registers and us “callers” read the SKU numbers off of the products while the cashiers entered those numbers into the cash register (this was before the days of the scanners we’ve all come to know and love). I worked my way up to Hardlines, as the technical sales guy, recommeding TVs, Stereos and other stuff, moved “up” to a stocker in back sundries (laundry detergent and bleach), freezer, deli and finally, forklift driver. To give you an idea how quickly they grew, I personally helped open 2 stores in the Denver in the last year that I worked there. Once WalMart bought them, they closed one of the stores, 06, but the other, 21, is still open as a Sam’s Club, which I still shop at. Things have sure changed from the original warehouse. There was no air conditioning, so summers were ridiculously hot. 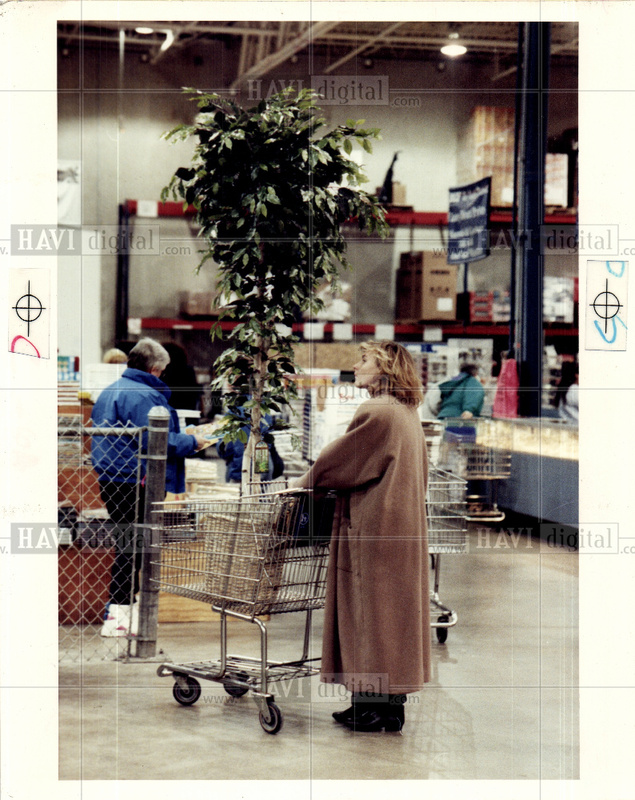 I remember the checkout line extending almost the entire length of the warehouse, and all 25 registers were open. Hard to believe that was almost 30 years ago. I am trying to remember if this was the warehouse that had a small section of railroad embedded within its flooring towards the rear of the building? I remember coming here as a young child and I remember seeing this oddity. Did I just imagine this piece of rail embedded within the concrete floor? Wow, brings back memories. I worked at the Pace on Oxford, now is Red And Jerry’s. They had a liquor store that I worked in, including :sundries(part of grocery dept.) turned into Sam’s Club.